At Innova, we want to share our passion for Irish dancing and inspire others to fall in love with it as well. We have both, a teaching school which prepares dancers of all ages for competition and a performance company which appears at a variety of events throughout the UK/Ireland and internationally. We are affiliated to the Festival Dance Teacher Association (FDTA) and have had competitive success with multiple Northern Ireland, Ulster and local champions in both solo and team categories. Meanwhile, our performance work has taken us on tours of Europe, the Middle East and Asia alongside numerous national appearances. 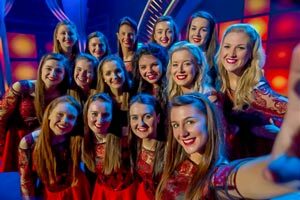 Innova reached the semi final stage of ITV’s ‘Britain’s Got Talent’ in 2014, finishing in the top 15 from 60 000 auditionees. We were also the subject of the BBC NI documentary ‘Jigs and Wigs’ in 2015. Our aim is to bring energy, fun, youth and a fresh approach to Irish dance, while creating life long friendships along the way. It’s time to push the boundaries! **Breaking News**. The fantastic new album "Another Way To Fly" has been released. It features many tracks which were debuted on our recent tour to China. Download it now from Itunes, Spotify, Google Play and other Digital Media Stores. Find out more about The SIDH via the links below. Click the links to be directed to our pages on Social Media. Live feeds to our media are at the bottom of this page. Another Beautiful cover from our very own Niamh Murphy. Click on the link below to view her video. Classes for the week commencing 22nd April have now been posted. We value all our followers and the support you give us. You can now check out all our live social media feeds below or click the buttons to be directed to their pages.